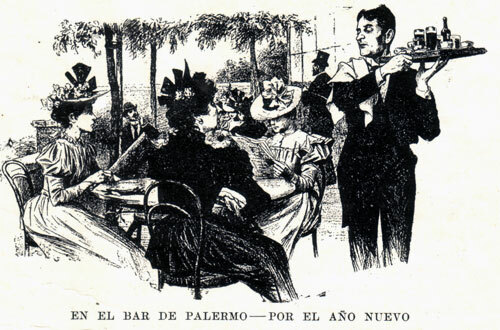 A sketch of the nightlife on New Year’s 1898 from Buenos Aires magazine. This spot should certainly find itself on Robert’s upcoming map of Barracas. Way down at the corner of Montes de Oca and California is Bar El Progreso. 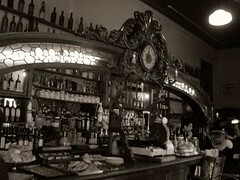 A sign above the bar proudly states that it has been around since 1942. Sometimes I feel that I shouldn’t blog about these places but this place is hardly any secret. El Progreso is on the city’s official list of notable bars. 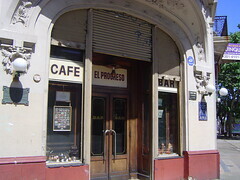 I was little surprised to find that it even has a Web site: Bar El Progreso. El Progreso wasn’t doing much business this past Saturday. Indeed, they were closing up just after 1pm. Siesta? And like every good bar El Progreso has its own resident cat. It’s a sad day in my barrio. Four blocks from my apartment is, or was, one of my favorite, old spots in the city, Bar Británico. 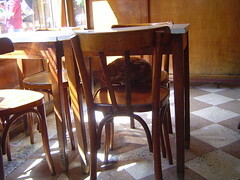 Located in San Telmo at the corner of Defensa and Brasil, Bar Británico was one of the classic cafes of Buenos Aires. I just returned from walking by the now closed Británico . Police are standing in front of the doors and all the furniture has been removed. It’s now just an empty shell. I didn’t even want to take a photo, preferring to remember it as it was before. On flickr you can see these photos that others have taken of this wonderful place. And be sure to look at this great photo. Británico has been fighting to stay open for months over a dispute with the new landlord. We signed a petition earlier in the year, along with 20,000 other people, and the case has been in the courts. The city also has tried to mediate a solution between the property owner and the tenant. The end came finally this month when a judge ordered the bar to be closed. This morning the police arrived to enforce the court order. The Clarín has an article about the closing, as does La Nación. [both in Spanish]. Several news crews were around so there should be coverage on the Buenos Aires TV stations tonight. 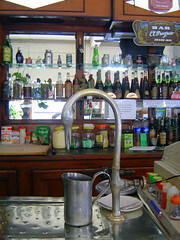 The bar has been run for almost fifty years by three guys from Galicia. They are José Trillo, Manolo Pose and Pepe Miñones. At almost any given time you could go into the Británico and see one of them, now old men, serving the beer and food to customers. José Trillo says that now that the bar is closed that he will return to Spain. The problems started when the former landlord died and the property was inherited by his son. The son Juan Pablo Benvenuto, seeing a prime real estate opportunity, didn’t want to renew the lease and rented the corner property to another person. True, Bar Británico didn’t have the splendor of the Tortoni and hadn’t renovated itself like 36 Billares but the Británico had an antiquated character that kept it a popular place. While its competition across the street El Hipopótamo is a nicer cafe, we preferred to take our foreign visitors to the Británico. The new tenant plans to open a cybercafe on the corner, as if the neighborhood really needs another one? How boring, you would think that with all this trouble that they could come up with something more creative. Update: The rumored cyber never opened, yeah. Bar Britanico re-opened some time ago and I’ve returned as a regular patron. It’s not quite the same as the old Britanico but it’s close enough. Last week a friend of a friend was in town. He was staying in San Telmo, so we took him over to Bar El Federal for dinner. 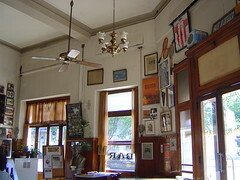 Located on the corner of PerÃº and Carlos Calvo, El Federal is one of those classic bars and cafés of Buenos Aires. Indeed, El Federal is one of the most picturesque places in the city. Yet, that also means that it is full of tourists. All around us everybody was speaking English. If it wasn’t for all the tourists, I probably would go to El Federal often. The prices are still very reasonable, no more than any other café in town. It’s surprising that they haven’t raised the prices with all the tourists that are in there. The food was decent but the service was incredibly slow. It took thirty minutes for the waiter to take our order; however, it was only that waiter’s second day and they were busy. We had a leisurely evening planned anyway, so it was okay. El Federal does have a beautiful bar. Photos just don’t do it justice. So, I would say that tourists definitely should consider El Federal as a place for stopping. (Plenty of other good, old bars in San Telmo which I need to cover in another post). Locals who have never been to El Federal should visit it at least once. Also, there’s a quaint little bookstore deep inside the café. Most of the books are used and overpriced (compared to the bookstores on Corrientes) but it’s interesting to browse for a few minutes.